We believe that regular physical activity plays an important part in the life of any student, helping them to stay physically and mentally fit and healthy and also providing valuable lessons about teamwork, dedication and good sportsmanship. 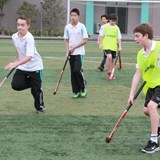 For this reason we offer our students the chance to participate in a wide range of sports and physical activities during their time at our private school in Shanghai. Our sports programme gives students the opportunity to learn, build skills and have fun with new experiences outside of the normal classroom environment. We aim to deliver a very high standard of coaching and competition, as well as providing enjoyable sporting opportunities for all, from kindergarten right through primary and high school. These include everything from regular PE classes, where students can test out a variety of activities and improve their physical ability, to competitive team and individual sports and fun extracurricular games. Read more about the competitive and extracurricular sports on offer at The British International School, and discover how your child can take part. Anyone with an interest in competitive sport will enjoy being part of the BISS Lions programme – 'Part of the Pride', as we like to say. Learn more about our highly qualified coaching staff, world-class training facilities, and the selection of sports, competitions and athletics associations your child can get involved with. For the enthusiast there are outstanding opportunities to play, have fun and keep fit on an everyday basis, without the pressure of serious competition. 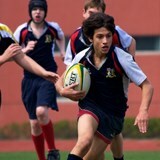 Explore our extracurricular sporting activities and find out more about physical education at our Shanghai school.